Human Resources Director Danielle Yarbrough presents her 2019 budget request to commissioners. DAWSONVILLE, Ga. – After months of preparation, Dawson County’s department heads presented their 2019 budget requests to the Board of Commissioners Monday. Commissioners scrutinized every line item in search of efficiencies that would save tax payer dollars. Superior Court Judge Kathleen Gosselin, Tax Commissioner Nicole Stewart, Development Authority Director Brian Trapnell, Human Resource Director Danielle Yarbrough and Probate Court Judge Jennifer Burt were the first to present their requests. Superior Court is asking for an increase of $16,297 in its 2019 budget to $516,971. Most of the increase is due to the addition of a fifth superior court judge to serve Dawson and Hall counties. Judge Clint Bearden was appointed to that post by Governor Nathan Deal in December. Stewart was next in line and she brought good news, informing commissioners that her department –which is ranked number one in the state in percentage of taxes collected – is seeking a budget reduction of approximately $22,618 to $429,054 in 2019. As they reviewed the presentation, Commissioner Julie Hughes-Nix noted that Stewart’s expenditures for legal fees also declined when the county hired County Attorney Lynn Frey. The Development Authority operated on a $150,000 budget in 2017. Commissioners voted not to fund the group in 2018 but has chosen to reinstate it in 2019. Trapnell requested an operating budget of $200,000, part of which would be to engage an expert consultant to identify options for Development Authority funding. Judge Burt is asking for a slight increase in her budget from $309,028 to $316,068. The increase is a result of the 2 percent countywide pay increase approved by the Board of Commissioner and the rest is in retirement contributions. In 2016, the Director of Administration position was dissolved and Human Resources assumed responsibility for risk management. HR Director Danielle Yarbrough presented a budget request for 2019 which reflected a $25,000 decrease in risk management costs. For non-risk management activities, she requested a budget increase of about $23,965 to $212,973. 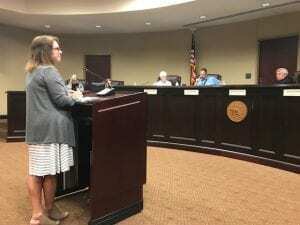 The increase would be attributed to group insurance ($6,000), retirement contribution ($5,000), general office supplies ($4,000), commission-approved salary increase ($2,000) and attorney review of the new county employee handbook ($4,000). In this case, outside counsel would be required to perform the review because it would be a conflict of interest for the county attorney to do so. Yarbrough is also asking the Board to approve a position for a human resource specialist at a salary of $34,153 plus benefits totaling approximately $19,589 and retirement contribution. Currently, there are only two employees in Human Resources. “The Society for Human Resource Management recommends one human resources person for every 100 employees,” Yarbrough explained. “So we are sorely understaffed.” The county has 284 full-time and 158 part-time employees plus 41 vacancies and 21 frozen positions. Budget reviews will be held at 9 a.m. each day through Thursday and the public is encouraged to attend. Tuesday, commissioners will review the public defender, elections office, extension service, finance department and public works/transfer station.